Welcome to Crazy-world where corporations rule and justice doesn't matter. Recall the California prison strike last summer. The strike lasted two months before an agreement was reached with the prisoners who were demanding an end to long-term solitary confinement, a harsh form of psychological torture. A hearing was held in the state assembly, outrage was registered by elected officials, and the torture policy remained unchanged. To hell with justice and the rule of law. The US prison system is becoming more and more privatized and with this comes a disincentive to rehabilitate prisoners and maintain or increase recidivism rates. The corporatization of the prison system demands profit and that requires prisoners in cells and the bilking of taxpayers for services which can be provided more cheaply by the state. The goal is to keep building more prisons to warehouse more prisoners, and to pass more and more laws criminalizing behavior, which impact the poor and communities of color at an alarmingly higher rate than in richer white communities. 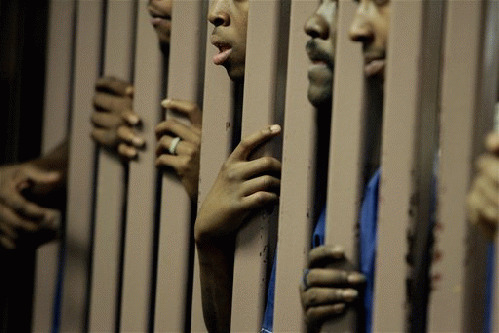 According to Population Reference Bureau (PRB): "In 2010, black men were incarcerated at a rate of 3,074 per 100,000 residents; Latinos were incarcerated at 1,258 per 100,000, and white men were incarcerated at 459 per 100,000." Justice demands that people convicted of crimes should undoubtedly be held accountable, but accountability does not require torture, or necessarily even incarceration for that matter. It is in the best interest of crime victims, the community in which the crimes occur, and the criminals themselves to partake in restorative justice practices, which can eliminate the need for incarceration except for the worst and most violent offenders. For the prison industrial complex, there's just no profit in real justice. PRB goes on to say that, "Prisoners also tend to be less educated: The average state prisoner has a 10th grade education, and about 70 percent have not completed high school." The relationship existing between education and mass incarceration, known as the school to prison pipeline, is directly connected to corporate America as well. No Child Left Behind (NCLB) and Race to the Top (RTTT) are the direct result of corporate America's endless thirst for profit. The penalties of these policies result in low performing schools, (which are mostly located in communities of color and in poor and rural districts), losing funding and qualified educators, and along with it, the one opportunity our children have to break free of the pipeline. We are basically seeing the warehousing of students until they finally commit a crime, which is often related to the War on Drugs. Where's the justice for these communities? How a child caught in this circumstance should be expected to become a valuable member of civilized society buggers belief. The direct cost of incarceration to states exceeds $5.4 billion annually. If we were to establish restorative justice practices and imprison only the worst and violent offenders, we could afford to fund our failing schools and cut the flow of inmates before the first crime is committed. It has been far easier to privatize prisons than privatizing schools, because we don't regard criminals and convicts as deserving--they are the "bad guys" after all--and they don't have well-educated unions, like the teachers, fighting for their very limited rights. Corporations recognize the power teachers wield and are doing their best to break teacher unions. Unfortunately even at their zenith, teachers do not have the power to overcome the wealth and power of big corporations. There is a disturbing trend whereby we set adrift entire communities of innocent children in poor underfunded school districts, knowing full well that a certain and growing percentage of them will land in jail--and that's okay. Well it isn't okay--not for our children and not for our prisoners, either. Quarterly profits are not the reason that we created schools or prisons. Education is paramount in a democratic society and to achieve a prosperous economy. Prisons are a necessary evil, but restorative justice can reduce incarceration rates, recidivism rates and help heal victims and their communities. We all profit in numerous ways when our children grow up and become productive members of society. We profit through the realization of entrepreneurial spirit and scientific discovery. We profit by minimizing poverty and through better health practices, not to mention the savings realized when we don't need to imprison our youth. We profit when young black and brown men provide for their families rather than wasting in jail. The law recognizes corporations as people, which have inherent Constitutional rights. They exercise those rights in the courts, through lobbying Congress and state legislatures, and through participation in our elections--much to their benefit but at a great cost to society. Corporations cannot fix the problems that exist in our education and prison systems. Because corporations are not people, they lack the necessary humanity and mercy required to transform both systems. Corporate involvement has only made the problems worse. The first step towards addressing issues within both systems is to remove corporations from the equation. The only way that can be accomplished is through the We the People Amendment, which states Corporations are not people entitled to inherent Constitutional rights and that money is not a form of protected political speech. If you want real justice, visit MovetoAmend.org to support this effort. We don't have to live in Crazy-world. Laura Bonham is a small business owner in Utah and a member of Move to Amend's National Leadership Team. She can be reached at Email address removed" title="" target=""> Email address removed .